Any instrument, any age, & any level. See the kind of focus & growth that you want! Countless hours of research and study have proven that the difference between the elite and everyone else is not what they practice but how they practice. For years musicians have been fed the story that “practice makes perfect”. The remedy for any problem has been to practice more, put in more hours, really grind it out! But what if I told you that all of that was wrong! What if I told you that all practice is NOT created equal? More importantly, what if I could show you how to get more done in one hour than most musicians get done in eight hours? Professionals practice differently than everyone else. They know that the key to progress is not putting in more mindless hours of practice. They know that the key to amazingly, incredible, out of this world results in your practice time boils down to one thing…being 100% deliberate and focused in everything that you do. The concepts in The Art of Practice have been tested and proven by thousands of satisfied students. It is the only course of its kind for musicians. It’s all about planning and developing your goals to create a practice ritual that will allow you to see the results you’ve always wanted to see. See that you don’t need 25 hours a day, 8 days a week to see progress. Learn the proper way to schedule, goal set, keep a practice journal, & eliminate practice killers. Here’s the thing…the reason I developed this course is because I believe you deserve to see the growth you want to see. I have taught these concepts to thousands of people around the world. 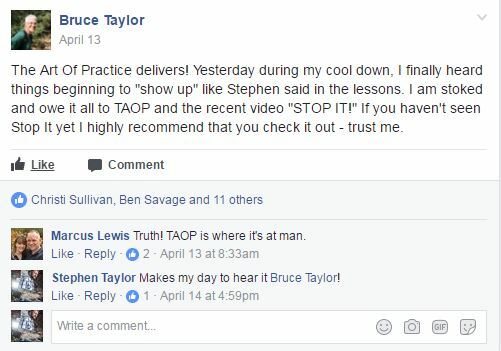 It’s how the professionals practice, it’s how I practice, and it’s how my most successful students practice. Why is it important to schedule? Is There a Bad Way to Practice? What is the Best Time of Day to Practice? We've all been there. Yes it's work, but it's also a joy. Sometimes we forget that. Rediscover what seeing regular progress in your practice time can do for you. Is this for all instruments? Yes. This course applies to all instruments, all ages, and all levels. Here’s the honest truth…I don’t want your money unless this course helps you! So, with that in mind…YES, I absolutely offer a guarantee. If you are unhappy within the first 14 days of the course, I’ll refund your money. No questions asked. I call it the “Steal My Stuff” guarantee. Seriously…you can go through almost half of the course, download all of the content and lessons, and then get your money back. I truly believe this will help you. I don’t just think that…I know that. I have hundreds of testimonials that prove this course works. I don’t believe in shortcuts. If you get into this course and realize that you aren’t willing to make the changes you need to in your practice time, then I don’t want you wasting your time. You’re worth the chance. I believe you have more potential inside of you than you will ever realize. It’s my job to help you see that potential. This course will do just that. I honestly don’t think you will need to use this guarantee though. I can count on one hand the number of people that have in the past. If you should need to contact us to cancel your account, simply email help@theartofpractice.online or call the studio toll free at 1-888-336-3111. I understand that everyone has a different financial situation. I don’t want that to keep you from improving as a musician. You will have the option to make one payment or split it up into 4 separate payments (1 payment every two weeks for a period of 8 weeks). If you choose to split the payments up, there is a $20 finance charge added to your total. What if I can't watch the lessons right now? Once you sign up and the course begins being taught, you will have 365/24/7 access to all content within the course. Feel free to watch the lessons immediately or wait until you have more time. The course is only made available a couple of times a year. Once you’re signed up though, you have lifetime access. All content in The Art of Practice is made available for download. All videos files, audio files, PDF’s, sheet music, and lesson resources. You can choose to stream them online or download them to view offline at a later time. What resources come with each lesson? All musicians learn differently. For that reason, there are a variety of options to choose from when working through the course. Ability to download or view online all additional sheet music and lesson resources. I’m serious about you really getting this content. No matter your learning style, I’ve got you covered! What is different about this course from other online lessons? Simple…this course focuses solely on strategy within your practice time. The majority of lessons on any instrument focus on the technical side of the instrument…how to play, what to play, etc. This course breaks out the strategy for how you should be working through all of the technical material. It’s something I was never taught and had to learn on my own. The beautiful thing is, strategy never goes away! If you don’t practice something for a month, it becomes harder to play. It goes away. But once you understand the principles taught in this course, you will always be able to go back and implement them to see immediate gains in your playing. 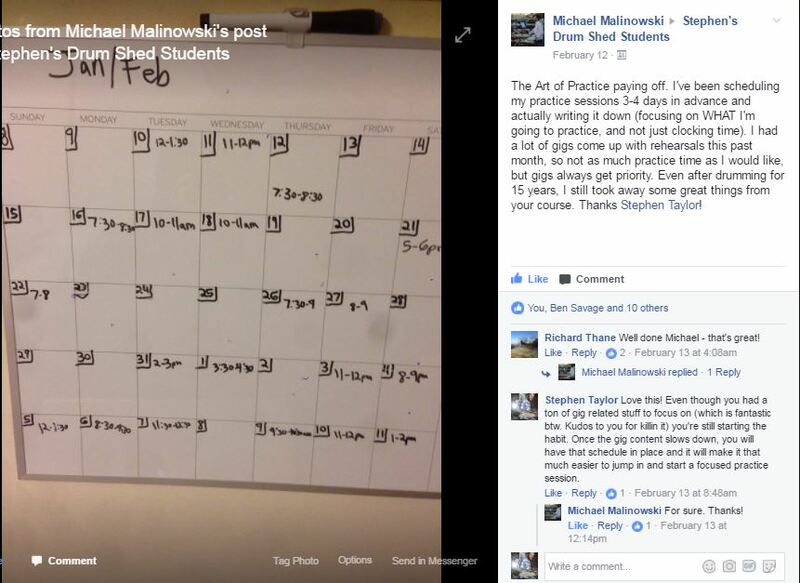 I have made it my mission over the past few years to figure out why my students were not succeeding in their practice times. This has led me to study fields such as metacognition, how the brain functions, the learning process, successful coaching strategies, daily rituals of elite performers, cognitive behavior, and a TON of other really boring subjects. I take all of those boring studies, statistics, and strategies and then deliver them in a digestible format. I have spent hundreds of hours studying, reading, discussing, and teaching the principles in this course. I have also spent over 7 years teaching online. I understand the format. I understand how we learn online. I understand what works and what doesn’t. I have worked thousands of musicians just like yourself through this material. That’s how I know it works. And if you’re REALLY interested in the topics I break out I also offer a complete reading list for you to refer to. All of the nerdy papers and books you could ever want to read on the subject! If you wanted to hire me to teach you this course privately, it would cost AT LEAST $2,000 and my schedule is so crazy who knows how long it would take for me to get to it (and I rarely accept new private students!). Bottom line is I wanted to make this no-brainer affordable for you because I love you like… um… well, I love you. In all seriousness, I wanted to make this affordable because I didn’t want amazing practice time results to be limited just to people who could afford paying big ticket prices! Over 20 hours of instruction in this course. All able to be played at any time, anywhere. In person lessons are one time, get it or not events. The format of this course allows you to learn at your own pace whenever you want. Ridiculous. Zero-risk 14 day money back guarantee. Now you might be thinking to yourself….why the heck would I GIVE YOU The Art of Practice for Musicians course for two weeks…and then give you your money back if it’s not for you? Have I lost my mind? Maybe a little but here is the thing, I know The Art of Practice is the best (and only) course of its kind out there and I want to prove to you that it works. And I know if you love it you will be addicted like a cat on catnip (in a good way), eliminate that unfocused practice guilt, eliminate the stress and see incredibly amazing results in your playing and practice time. And if not, I don’t deserve your money. Plain and simple. Select your plan below and you will be off to the races. 14 DAY	money back guarantee	boom! ZERO RISK. Try it FREE for 14 days & if you’re not happy, get ALL of your money back! I want to make the process of learning your instrument as easy, awesome, and stress free as possible. And I stand behind The Art of Practice and know that if you try it you will love it (and will be hooked like a cat on catnip… in a good way). Test drive it for 14 days (and yes, you get every single feature and resource), and if you aren’t happy, simply cancel anytime in the first 14 days and you’ll receive a full refund, no questions asked. No more crazy long hours, no more frustrating practice sessions, no more guessing. Just focused, results driven, and productive practice day in and day out. Choose one of the 2 plans below to get started! 14 day "steal my stuff" money back guarantee! ZERO RISK. 14 day money back guarantee! I always knew what to practice, but never seemed to be able to measure progress in a meaningful way. I always suffered cognitively & emotionally because of it. TAOP4M taught me it wan’t the material or a lack of ability, it was a lack of knowledge regarding HOW to practice. Since employing the TAOP principles, my growth is intentional & inspirational. It revived my love for learning the instrument. I was a bit reluctant to invest in a program. I was BLOWN away! It’s absolutely phenomenal what is in this. With the assembly lines I have charted out what I want to work on for the next 5 years! This course is amazing! I learned to love and be patient with my playing. I can’t recommend this course enough. Stephen was very accessible, he answered questions, was enthusiastic and kind. You’re missing out if you don’t do it! I grew up playing soccer…TAOP helped me see that there is a relation between how you practice soccer & how you practice music. Thank you for everything that you’ve done for me! No more crazy long hours, no more frustrating practice sessions, no more guessing. Just focused, results driven, and productive practice day in and day out. Choose one of the 3 plans below to get started!